OmShanti offers this one of a kind yoga and meditation retreat all year round; therefore, you can join any day you want. Different from any other retreat on offer, this is a free to do and attend retreat, which means that you decide if you want to participate in the activities or not. This helps you develop and evolve at your own pace. Nevertheless, participating in as many of the activities on offer in the house is recommended to really get the best of it. Join to live healthier and happier! The house is a very big masia which has been documented from XI century as the house of the feudal lords of the area. It’s about a group of houses that were built over the years making it a very big property with room for about 20 people. It has many dining rooms, living rooms, kitchens, wineries, chapels, interior and exterior patios, gardens, orchards, and about 27 hectares of forest and land. The masia is fully renovated following the sustainability criteria keeping the original essence of the house and the time, preserving historical and ecological value, and integrating it with the natural surroundings. There are about 10 rooms in the masia. Some of them are shared (two people in total) and others are private. The rooms have all the necessary equipment, comfortable beds, blankets, light, electricity to connect devices, and some of them have a beautiful view to the mountain. The masia also offers free use of laundry machine. The masia has three showers and three toilets within the house. Wi-Fi connection is available in many areas of the house. The kitchen is a very special place as it is fully equipped to prepare healthy and conscious food, such as juice processors and mixers for juice detox. One of the main rules of the house is that it is 100% vegetarian and vegan. No meat of any kind is allowed. As a conclusion, it is the perfect place to retreat yourself, to regain some energy, especially to have the time and the support to go inside, and to discover who you really are. Omshanti has a general heating system for all the house, and in each of the room, dinning area, kitchen, halls. As support, there are electrical heaters and gas heaters as well. Please note that Comunidad OmShanti Barcelona offers teachings in English or Spanish. More than 50% of the people visiting Comunidad OmShanti Barcelona speak or want to learn Spanish so the teachings are in Spanish but with the support of English translation. Some of the excursions into nature will be part of this retreat. OmShanti is located about 40 kilometers (30 minutes) away from the beautiful and international city of Barcelona, in the Biosphere Reserve of Montseny (Sant Marti de Centelles), which has been proclaimed by the UNESCO as a Universal Heritage of Humanity. The food is 100% vegetarian and vegan. All of it is prepared with so much love by the hands of the family living in the house. Day by day, you will learn how to cook healthier and happy, as it is a very important part of the yoga practice. Breakfast, lunch, and dinner, as well as snacks and fruits during the day are included in the price. OmShanti offers different activities depending on the teachers that are living on the house. The activities that are mentioned are not happening at the same time and are rotative, so it is possible that you don't get to participate in all. Additional activities include permaculture work, handicraft workshops, therapy through dance, music, Reiki, Tai-Chi, chi gong, acupuncture, massage, activities for kids, love circles, word circles, psychological work, holy walks through nature, fire ceremonies, movie nights, philosophy classes, trekking along the nature, visit to rivers, waterfalls, and much more. Some of the excursions into nature will be part of this retreat and some will be part of the self-discovery of people. The places that OmShanti suggests are the Biosphere Reserve of Montseny which has been proclaimed by the UNESCO a Universal Heritage of Humanity. It is full of rivers, mountains, rock climbing, Roman old structures, big variety of trees, flowers, and animals. Spa treatments are not included in the retreat price and need to be booked in advance. Many kinds of massage, acupuncture, and Reiki are on offer. As mentioned before, OmShanti is in the middle of the Biosphere Reserve of Montseny, which makes the perfect place for people who are interested in nature, long walks, trekking, camping, animal sight, bicycle rides, extreme sports such as rock climbing, paragliding, rapids, etc. Also, as in most parts of Europe, there are old ruins that go far back in time more than 2000 years. Therefore, it is beautiful to find them in the middle of nature and also in the villages around, very close to the masia. There is the city of Vic, which has a Roman colosseum which is used right now as a museum, and around it, there is a very old market with many organic veggies and things. The beach and the beautiful Mediterranean Sea is just 35 kilometers away, about 30 minutes by car and one hour via public transportation. There is a straight train from the house to the sea. The city of Barcelona has so much to say about it for lovers of arts, music, museums, restaurants, shopping, cinema, beach, and much more to do. Anyway, OmShanti is in a strategic area which gives the fortune to be in nature and at the same time to be very well connected to city life. Please book your flight to arrive at Barcelona–El Prat Airport (BCN). To get to the house is pretty simple. For those coming from abroad, the first stop will be Barcelona–El Prat Airport (BCN), which receives flights from all the world around. From the airport's terminal one or terminal two, you take the bus (Aerobus) which goes directly and non-stop to downtown Barcelona (Plaza Cataluña). In Plaza Cataluña stop, you come down from the bus. The ride takes about 15 to 20 minutes. Right away, you will find the Plaza Cataluña Train Station. There, you will find the R3 train direction to Vic. In approximately 50 minutes, you will come to Sant Marti de Centelles station, where OmShanti will pick you up from train station to the house. You will go in their car about five minutes for 2.5 kilometers. 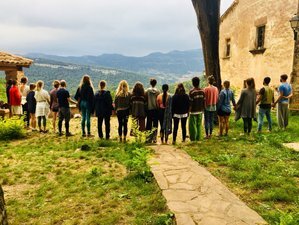 Comunidad OmShanti is a home providing yoga retreats, where families meet and share their own beautiful being contributing in this way to make a better world. This retreat is available all year round. You can arrive on any day of the week. Please select an arrival date below. The prices below include a special discount of 15% per person only for November 15 - 23, 2018. Please inquire for more information.